Text of an email sent by Mick Doherty to Falkirk Council regarding their decision to not only allow, but to subsidise an Orange Walk in Falkirk District. I am writing to enquire as to which Councillors were present, and who voted in favour of subsidizing the Orange Walk. I assume that these are not classified records and may be freely shared with members of the public. If you could please send me the voting tally and also a list of contact info (email addresses will do) of our Councillors, so that I may write to them personally, I would be very grateful. As a lifelong citizen of Grangemouth in Falkirk District, and incidentally also a lifelong Rangers supporter who was raised Protestant, I am deeply shocked and appalled that Falkirk Council would, in these days of Westminster enforced austerity, with cuts to vital services happening constantly, vote in favour of subsidizing what is, at its core, a celebration of religious bigotry! We hear from our supposed leaders all the time about how we need to stamp out sectarianism, not just in our sports, but in our society as a whole, and then our councillors vote in favour of not only allowing such an inherently divisive and sectarian walk, but also to subsidize it! By doing this you are not only tacitly approving sectarianism, you are also alienating those sections of our society that this blatant display of religious bigotry is aimed at! It’s really a bizarre thing. It would be fascinating to find out how this decision was made. It’s unusual for public funds to go to anything that’s explicitly religious in purpose, and there can be no doubt that the Ludge is explicitly religious in its purposes. Does anyone have any more detail on this or are we waiting for a response to Mr. Docherty’s letter? I hope local folk will keep asking questions about this because it just seems such an easy thing for the cooncil to say no to when money is tight. Is Falkirk experiencing a rapid influx of dangerous Papists that have to be fought off? Is Our Protestant Way Of Life under threat? Weird, weird, weird. Howling laughing here. Cheers Kenny, not heard that expression for yonks! look forward to the same outcry over the funding given to the muslim eid in the park event in july, as we all know islam isn’t fully inclusive and eid is a religious festival, should they get funding? If it wasn’t for police scotland withdrawing from providing what we ALL (ORANGE LODGE MEMBERS INCLUDED) pay taxes for then this situation wouldnt have happened. so apportion blame to those who caused the problem and that is police scotland. Mr Docherty should not have to justify his back ground to make the point he does. Thank you for taking action by eloquently writing what a large number are thinking. I understood that it was illegal for local councils in Scotland to give grant aid to religious bodies. Individual councillors could find themselves financially liable and “surcharged” by the Scottish Office. Is this no longer the case? Or can I presume that the Orange Order is not classed as a religious organisation? “surcharged” by the Scottish Office your having a laugh right? How kin the see out o them glesses? Who needs sight when blind hatred is your guide? Silence in the main from everyone/everywhere is deafening or am I just being paranoid? If it is true and not another click bait then heads must roll at the coonsil , for funding a trip to benidorm by the back door. 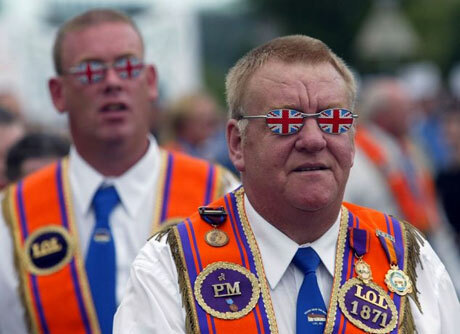 Apart from that – the orange order says it is a religious organisation, yet is involved in politics. Salient questions are: how much political power does the orange order exert? And does it acquire that political power by standing candidates and getting votes in its own right? Or does it piggy-back on other political parties? Do voters know whether a candidate is an Orangeman? Where does an elected Orangeman’s loyalty and interests lie? With the legitimate party? The voters? or the orange order? Still , No Surrender , apart from when theres a cheap deal on holiday to Benidorm , so thats maybe Yes Retreat away fae it at hame mair like. I think they have been doing the whole walk thing there since about 04 , and it has been expanding to other “Sports bars” including Turkey. Is there a solution for Scotland , yes. It requires more than just the joke legislation thats just about songs in football stadia , though I have yet to see any talk of this regarding the Hibs/Rangers final….but we are talking about the media here. Perhaps the simplest option is to allow a one question referendum on every election ballot paper , council and Holyrood , towards the people deciding on whether they want to allow parades at all in their constiuency/council area for the duration of that term? Then we can see change , directed by the voting public , focusing these celebrations where they are wanted only. The Orange Order is an arm of the Unionist government Ben ,under the guise of religion . They were probably shipped in from Ulster to boost numbers for that march . The very sinister side of it is that it shows you the kind of tactics they would have no hesitation in employing if they thought the people of Scotland were getting the upper hand in the Independence debate .